There can be no doubt that this year is an irruption year for Red-breasted Nuthatches. Sitta canadensis isn’t just irrupting out of its far northern home but exploding southward, with reports in every southern state except for Florida, including birds on the outer banks of North Carolina, on Grand Isle, Louisiana, in a suburb of Atlanta, and on the Gulf Coast of Texas. Bird bloggers from Wisconsin to Massachusetts have noticed the irruption and blogged about it. But just how much have Red-breasted Nuthatches shown up since their irruption started in August? Check out this graph adapted from eBird that shows the frequency of sightings in the United States in 2012 – Red-breasted Nuthatches are showing up on birders’ checklists just over sixteen percent of the time! But why are the nuthatches irrupting? The usual understanding of why irruptions of birds – from Red-breasted Nuthatches to Snowy Owls – occurs is that there is a shortage of food. No lemmings left in the north? Birders are delighted by Snowy Owls. No cones from which Red-breasted Nuthatches gather seeds? 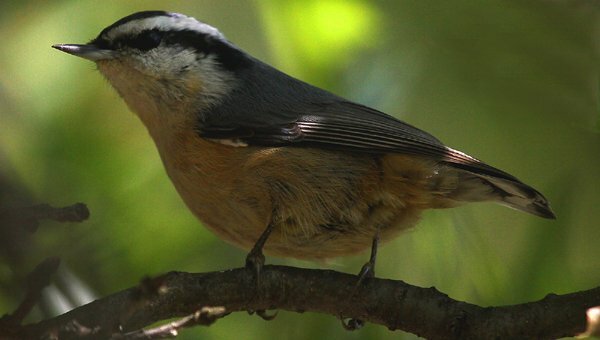 Birders across the United States are delighted by the “yank-yank” of Red-breasted Nuthatches on sixteen percent of their outings. 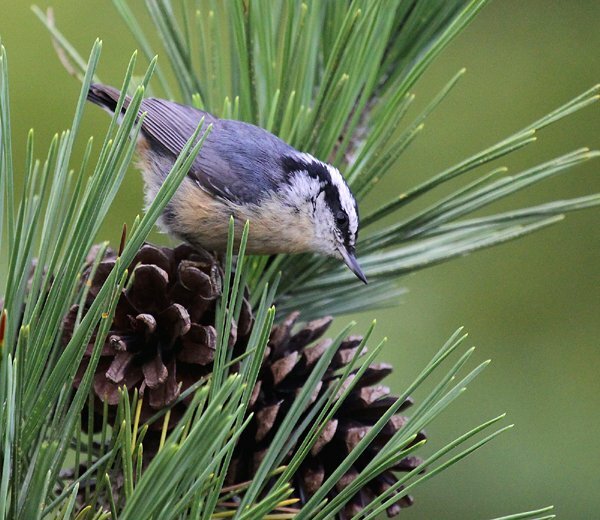 Do nuthatches have the same boom-type population burst because of good conifer crops? Yes and no, or at least, that is what I theorize. Red-breasted Nuthatches rely on seeds from conifers as a staple when they winter in the far north. Young birds are fed on what all young birds are fed on – lots of protein. Bugs, caterpillars, and other assorted creepy-crawlies are what young nuthatches get from their parents. But when winter came to the far north last year their diet, like their parents’ diets, changed to seeds from cones. And because cones were abundant nearly everywhere in their range, they had plenty to eat. And because they had plenty to eat they did not have to travel great distances to find food, which is the most dangerous undertaking a bird, particularly a young bird, experiences. That means there were a lot more nuthatches around this spring to breed and that means that there are lots and lots more nuthatches to irrupt across the United States right now. Thank a pine cone. Or a spruce cone. Or a larch cone. I don’t want to understate my lack of scientific credentials, which is total. Also, I don’t really trust that eBird data for previous irruption years – which seem to indicate that this year is a much larger irruption than past years – is entirely accurate, simply because many more people are using eBird now than in past years and the number and quality of checklists entered into eBird is up. Anecdotal evidence seems to indicate that this irruption year is larger than most but I would like to see some rock-solid empirical data. If anyone has anything further to add, or wants to scold me for my ignorance, please feel free to have at it in the comments. They are irrupting to increase the chance of one making it across the Atlantic and into my Heidelberg backyard alive. Very friendly they are , especially one that has taken a liken to me !? He waits everyday for me to come out so he can eat. So sweet! One more reason why everyone should be using eBird vigorously. As Cory rightly says, some of the historical data on eBird is suspect because its uses has blossomed so much in just the last several years. But if we all keep at it by recording all our sightings, the next irruption of RBNU will have comparable data for this year and subsequent “down” years. Citizen science for the win! Data from bird banding and migration watches (like the morning flight watch in Cape May) might help answer the question of how big this year’s irruption is compared to those in past years, but I’m not sure if that data is easily accessible to the general birding public. It would be interesting to see the numbers from those sorts of operations, though. I’ve already seen two Red-breasted Nuthatches in my neighborhood this fall (which is quite extraordinary considering that I’d previously only seen one here in the past five years). I’ve noticed more in the Boise area this year than ever before. I’ve been hearing them even in my suburban Meridian, Idaho area, which is usually very limited in the variety of birds. What might this suggest for other winter finches? Bring on the Redpolls and Crossbills! 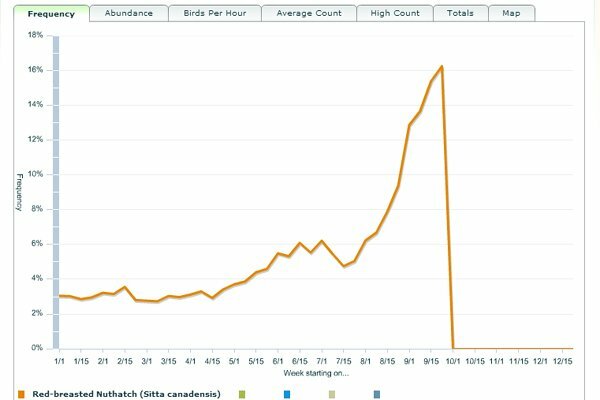 I think there’s already enough eBird data to show the previous irruption. Check out the 2007-2011 graph and look at the end of 2007 and beginning of 2008. Next week could be the peak. @Jason: Yeah, the last several years have been good but I was hoping to get some kind of historical perspective. And you know what is cool about the chart you linked? Look under the “total” tab and see that 2010 looks like many more birds actually showed up though they were apparently more widespread in 2007. After reading this article a few days ago, I have done a quick tour of my yard after work. Yesterday it was a flock of yellow rumped warblers. Today, there was one red-breasted nuthatch out front. Thanks for the impetus to go looking! Two years ago, I regularly saw RBNUs at my local (Northern VA) parks, starting in late October and staying around through March-April. Last year there were none. I wondered why, and noticed that there were no new cones on the pines – they all looked dried up. I assumed that any RBNUs that came through had kept on going. This year, there are again no new pine cones on the park trees, but the RBNUs arrived in early September (in great numbers) and are staying around. I doesn’t appear that there is a bounty of cone seeds to feed on here either, so I wonder how they will fare? I’d speculate that this might be a population crash year for RBNUs. I hope not, they are one of my favorites. @Liz: Glad you found one! @Greg: They only rely completely on cones when they winter in the far north (out of necessity). When they are in more temperate climes Red-breasted Nuthatches have far more catholic tastes. They are also irrupting on the West Coast — numbers are up from Petaluma through the Santa Cruz area all the way to the Mojave Desert. I just had the first ever for my yard in Barstow, CA. First ever in my yard in Oak Run, California, and I’ve been here for 30 years! Oh, by the way Corey, great shots of the Nuthatches! I especially like the first one with the little guy on top of the cone! Here is a graph of the number of RBNUs per 100 party hours of Christmas Bird Counts from 1960 to 1985. In my South Houston (Pearland) suburb, I have seen lots of RBNU today, 10/20/12, at my bird feeder. The last time we saw any this far south along the Gulf Coast, was about 12-15 years ago. We are Very excited and hope they stay all winter. Correction to my previous post: the date today is 10/29/12. Happy to see them at my Oakdale, Long Island NY bird feeder. 🙂 … I discovered his identity here at your website. Thanks! We’ve never recorded them here on Dewees Island, and we have hand entered bird surveys from the last 20 years. Only one was ever recorded, in January of 2011. This year there is at least one pair on the island and probably two, with repeated sightings for almost a month. Thanks for all the great info– I am linking to your blog from the DeweesIslandBlog. Saw several red breasted nuthatches at my feeder today, along with the flocks of chicadees and tufted titmouse. I live in suburban Maryland and didn’t see them last year at the feeder. They are very quick – they just grab a sunflower seed and fly away, then return again and again and again…never staying for more than a quick second. I live in Morehead City, NC and have never had Red Breasted Nuthatches. They are in my bird bath everyday, but I do not have a good count on how many. Just got my first photos of a Red-breasted Nuthatch today for Buckskin Mountain State Park in Arizona. I thought heard one some weeks ago, but this was my first sighting, and it was in an olive tree. December, 2012, here in Matagorda County, Texas, the Red-breasted Nuthatches started appearing at my Sunflower Seed Feeders right about the time Hurricane Sandy was hitting the Northern States. WOW! This is a new bird! I had to go online to find it’s ID since this is an unfamiliar species to the backyard. The regular Chickadees and Titmouse are not particularly happy since the Nutchatches moved in being so numerous. They wait for their chances to sneak in at four feeders, although, I’m happy to have them all! By the way, I am still seeing Hummingbirds, so, also, have to keep those feeders supplied. Saw a red-breasted nuthatch at our feeders in Springfield, IL on 12/16/2012. I first sighted these birds two summers ago on an island of the coast of the Lower North Shore of Quebec (Near Labrador) and now they are here by the thousands! This is the first winter we have seen them staying here, and my father just reported to me that farther up here in the woods that he has seen dozens of them dead on the forests floor. My gathering is that they are freezing to death. So sad cause they are a pleasure to watch and they love my homemade suet. Photographed a red=breasted nuthatch this afternoon, February 2, 2013 in Lee County, VA which is about 20 miles east of Cumberland Gap. First one I have ever seen. Friends of mine and I documented dozens of these last winter from Cordova to norhtern Mississippi. It would be great to see these return to the region and capture additional images. 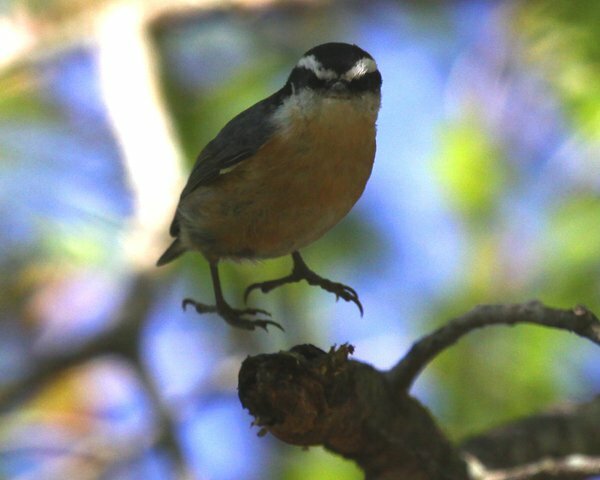 An update to the previiously posted note: sightings of Red-breasted Nuthatches have been reported in McKenzie, Tennessee. This is in the northern portion of the state, just southwest of Paris.